The University of Alabama has won more than two dozen national championships and numerous more conference championships and individual achievements. Way to go Crimson Tide! Big spirit in a smaller size! 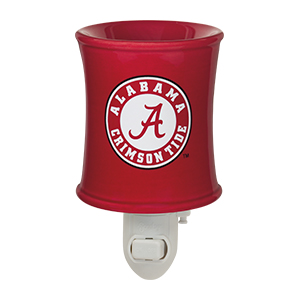 Feature your team’s logo — and your favorite game day fragrance — in even the smallest spaces. 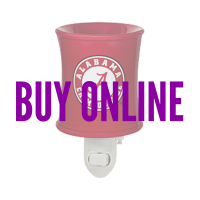 University of Alabama Scentsy Mini Warmer uses a 15-watt Scentsy light bulb. Scentsy Candle Warmers are the flagship product of Scentsy fragrance brand. Our unique Scentsy Nightlight system uses a 15-watt Scentsy light bulb to gently warm our wickless candle tarts. By melting our wax at a low temperature, we maximize the strength of a Scentsy bar and the life of the scent. Scentsy Candle bars are never “burned” because they are wickless. Each candle bar will last up to 80 hours of “on” time. Shop for Scentsy Candle Warmers and have your products direct shipped to your door.